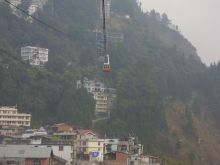 Gangtok is accessible from Siliguri by road only & situated at an altitude of 5,047 ft. Its 125 kms and 3 ½ hrs journey. Journey to Gangtok is really beautiful through straightway and very few ups & downs or zigzags accompanying by river Teesta more than halfway. It’s an interesting road. You simply penetrate those hills and feel the changes of characters of the hills. Gangtok nestling in the lush greenery of the Himalayas is the small capital city of Sikkim, where Buddhist prayer flags flutter in the mountain breeze, exotic orchids and chirruping birds run riot in a colorful melee. Visit Gangtok for a peek at the profusion of blooming rhododendrons in the deepest of reds and savour the serene cool beauty of the snow clad peaks in an ambience enhanced by the cheerful bustle of a warm, hospitable, pleasant and hard-working people. Gangtok is a blend of the traditional and modern, where modern concrete multi-storied structures clinging to the hillside stand alongside ‘chortens’ (stupas) and monasteries; young college girls in trendy dresses rub shoulders in the market place with elderly matrons clad in traditional 'bakus' and lamas in colourful maroon and mustard robes play football with youngsters in blue jeans and T-shirts., puja and recitation in different Monastery on the other side modern songs at Night Clubs. Bonvoyage Leisure has designed and arranged Gangtok tour packages under Gangtok holidays along with local sightseeing, Gangtok local tour, places to visit, tourists attractions, hotel bookings, transport booking etc. All kinds of hotel and resorts booking ie., standard hotels, deluxe hotels, luxury hotels are booked under Gangtok holiday packages .